Before I wised up and turned off the notifications, the Facebook app on my phone used to ping every time someone liked or responded to one of my posts. I generally charge my smartphone on the other side of my office while I work, but the sudden and unexpected ping of a Facebook notification would prompt me to get up, walk across the room, and discover that my mother had liked a photo of my kids that I had posted. This was not exactly a model of efficiency in terms of getting work done. Trying to ignore those pings was even worse, though. After hearing one go off, I would sit at my desk, trying to focus on my work but agonizing over what I might be missing on Facebook. Yes, it might be a family member liking a picture of my kids. But… what if it were Stephen King commenting on my pithy (and oh-so-timely) post about The Shining and offering me a chance to collaborate on a novel together? How could I work while fearing that I might be missing out on the opportunity of a lifetime? My experience is hardly unique. In fact, according to a study by JWT, out of 900 Millennials in China surveyed, 72% of them said they experience some form of FOMO. We're suffering from the nagging social anxiety that we might miss out on something more awesome that what we are already doing — and social media just fans the flames of our FOMO. The problem is that our fear of missing out keeps us from being present in our own lives. We bring phones to the dinner table rather than talk to our significant others, we waste time at work rather than commit to our careers, and we abandon last month's hobbies and projects in favor of new fads that will in turn be abandoned next month. Ultimately, living with a heightened sense of FOMO is a good way to make yourself crazy, lonely, broke, and overwhelmed. 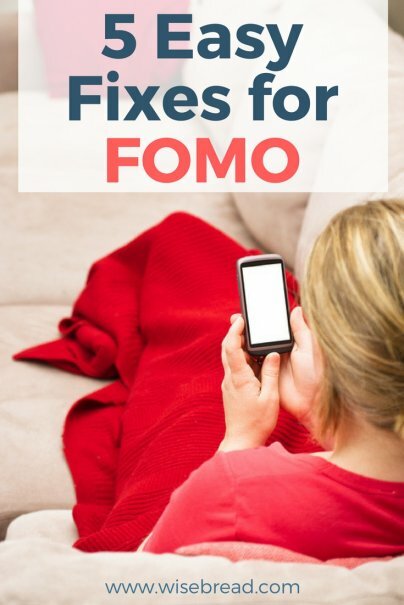 Thankfully, there are steps you can take to cure your FOMO without cutting yourself off from the world. Here are five ways to overcome FOMO for good. The problem with social media is that it's always available, which means you can indulge your FOMO by checking in 24/7. So it's up to you to set hard limits on your social media use. Specifically, download a blocker that keeps you from checking Facebook, Twitter, Instagram, or any other site that you check over and over again due to FOMO. Blockers like StayFocused give you a specific number of minutes per day that you may surf the verboten sites, at which point you will not be able to access those sites again until the next day. This kind of hard limit will not only help you to better focus when you are trying to work or study, but the shortened amount of time you can visit the sites puts a major wrench in any sense of envy you might feel while browsing your friends' postings. If you know you have 15 minutes of Facebook time all day, you're much less likely to spend 10 of them sighing over the pictures of your cousin's roommate's trip to New York City. We have a tendency to forget that other people's lives are just as full of boring, frustrating, and tedious details as our own. When we look at the beautiful images of the sun rising over Tuscany posted by a friend of a friend, we envy the Italian vacation, and forget about the long slog she had saving up for the trip, the hour she spent in line at the post office getting her passport updated, and the terrible air sickness she suffered on the plane trip there. The best way to deal with the disconnect between the boring parts of our lives and the exciting parts of other people's lives is to remember that everyone has boring moments. No matter how exciting a person's life is, they will have to spend a portion of it washing the dishes, filing taxes, and waiting in lines. Just as nervous public speakers are told to imagine their audience in their underwear, FOMO sufferers should imagine that the objects of their envy are stuck in line somewhere. It will remind you that no wondrous moment ever came about without a lot of boring moments beforehand. Mindfulness is the practice of being present in our lives and providing ourselves with non-judgmental awareness of our experiences as we experience them. Cultivating mindfulness is a sure antidote to FOMO, because once you are fully aware of what and how you feel, you have a better sense of what makes you feel good, and you are much less tempted to chase after opportunities that don't promise happiness. Meditation is a common way to practice mindfulness, but you can choose any number of methods for being more present in your life. In particular, paying closer attention to your body during meals is an excellent way to learn mindfulness and practice healthy eating habits at the same time. Listen to your body's hunger and fullness cues, take the time to truly taste and savor your food, and take in all of the sensory input of your meal. Starting your mindfulness practice with food can help you learn to be more present in every part of your life. Self-help gurus may often tout the importance of saying yes to life, but there's a limit to the amount of things any one person can do. If you suffer from consistent FOMO and waffle on decisions, then it's a good idea to start getting in the habit of making no your default. This way, if you say no to an opportunity but keep thinking about it, you'll know that it's one you truly don't want to miss out on. Making no your default answer allows you to get in touch with what you really want to do, rather than continuing to chase every opportunity you see. At its heart, FOMO is the sense that there is something better out there than what you already have. But what you already have is pretty darn wonderful, if you take the time to appreciate it. There will always be something out there that you are missing out on. But creating a satisfying life free from FOMO is possible. You just need to be willing to live mindfully and actively enjoy what you already have. It also doesn't hurt to turn off those Facebook notifications.